I woke up this morning to a phone call from my husband wishing me happy anniversary–from downstairs in the kitchen! I rushed down to find that he had gotten up extra early to cook breakfast for me. BEFORE HE LEFT FOR WORK AT 6AM. 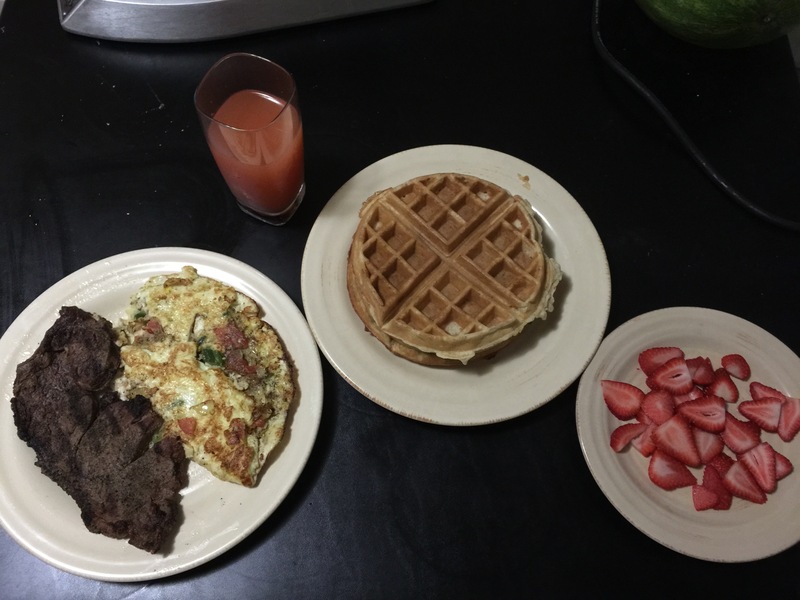 Orange strawberry banana juice, banana waffles, sliced strawberries, veggie omelet, and a ribeye (grilled last night)! The beautiful thing isn’t just how he surprises me on the special days. It’s his faithfulness on the not-so-special days. The regular ol’ plain vanilla ones. When he wakes up extra early to worship the Lord and abide in His Word AND clean out the dishwasher. When I’ve hit the proverbial wall and just can’t do any more housewifing or mothering or breathing and HE HANDLES IT. Whatever IT is at that moment–often after working a full day/week of manual labor. He hates when I brag on him. But I can’t help myself. He reminds me of God’s love for me. I never have to worry about my husband’s faithfulness. He takes his covenant with me seriously. When he doesn’t feel like doing something, yet he knows it’s in the best interest of his family, he puts his own desires aside and does whatever needs to be done. He is always thinking of how to provide for, care for, and protect us. God’s love in Christ is like that. Faithful. Sacrificial. Protective. Nurturing. Too often I will see a woman with a man who hasn’t demonstrated faithfulness to God, hasn’t developed a sacrificial bone in his body, leaves her vulnerable to the wiles of the enemy, takes advantage of her rather than cultivating her–yet she somehow hopes that he will be faithful to her in marriage. That he will sacrifice his wants for her needs. That he will guard himself and her from physical & emotional danger. That he will cultivate her walk with Christ when he isn’t even cultivating his own. I grieve. I have been in her shoes. I’m on the other side of marriage, after the pomp and circumstance of the ceremony, beyond the honeymoon bliss. I’m in diaper-change mode. Constant discipline mode. The We-Hongry-Whatchu-Make-For-Dinner Zone. It takes a lot more than tight abs, chocolate skin, and a nice wardrobe to get it done on this side. It takes knees chafed from prayer and a big dose of humility for our stiff necks and backbones and dying to self and a singular unwavering commitment to the One who holds all things together by the word of His power and diligence in the dark and character when no one else is around and giving each other unmerited favor and not giving each other what we really deserve. Over and over again. Until we die. 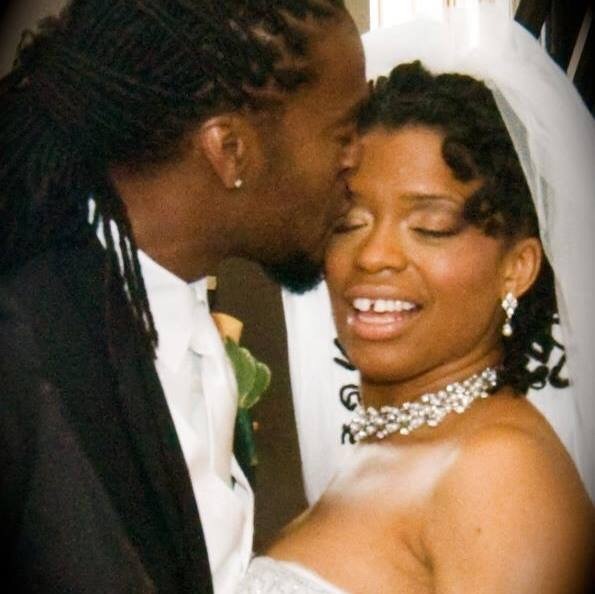 So on our anniversary, I’m thanking God for the husband I have. I’m grateful for the second chance He gave us at life and love. I’m overwhelmed by God’s love for me. For us. I’m forever indebted to God for turning me from my foolish ways of thinking and acting and giving me a new heart and mind to pursue what He wants. And I’m as committed as ever to helping other women walk in the true beauty that God has for us in Christ.